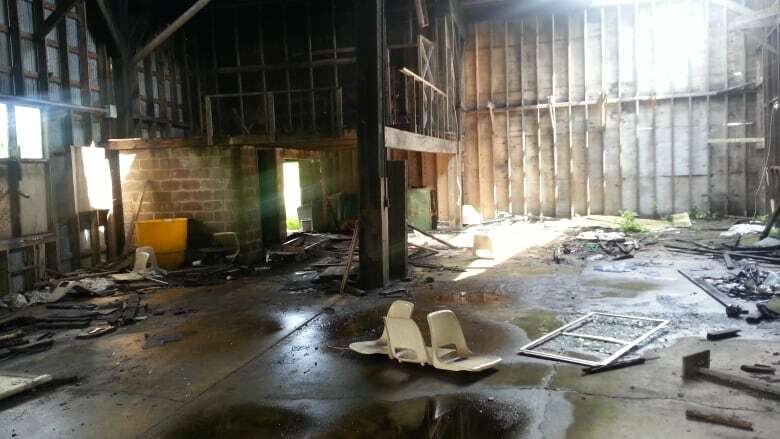 People in Cape Tormentine want the province to tear down three provincially owned buildings because they say the structures are unsafe, falling apart and bringing the community down in value and spirit. "This place was a thriving community, and now look at it," said Sonny McCarron, who returns to his hometown every summer and says Cape Tormentine isn't the same place he grew up. Three buildings left behind from Cape Tormentine's time as a transportation hub between New Brunswick and Prince Edward Island are falling apart. The once flourishing community offered ferry service to the island, but that ended when the Confederation Bridge was completed in 1997 and the ferry stopped running. "Since the bridge, and since CN Marine left, we're left with this water tower [and] this fallen down building," he said. Jeanne Allen of the Cape Tormentine Community Development Corporation runs the local camp ground and says the buildings that need immediate attention. "The water tower is an eyesore, but maybe not a safety issue. These other two are a safety issue," she said. Allen said most of the floor of the former train station has fallen in. The building once housed the tourist information centre, but she said it was moved to Cape Jourimain when the Confederation Bridge was built. Another structure of concern is what Allen calls the roundhouse, left over from the days when the trains came to Cape Tormentine. "If it has a good wind or whatever and it falls down or happens to blow over when the kids are around, somebody is going to get hurt." Allen says the issue is especially pressing this month because a festival is planned for the New Brunswick Day long weekend. She is expecting about 150 trailers to be parked in the area. "There's no signs, it's not fenced off, so people that are coming down with grandkids … there's no way of us policing them getting into that building." Allen said she's contacted both the local MLA Bernard LeBlanc and the Department of Natural Resources but hasn't heard of any plans to help the community. She's wants permission to tear the buildings down. "Then we can contract the work and have it torn down as long as they would pay for it. It's not our safety hazard, it's theirs but it impacts the community here." McCarron hopes something is done soon. "I bring my grandchildren and show them I grew up here and they just look around and shake their heads." Marc Belliveau, with the Department of Natural Resources confirms his department owns the land. In an e-mail he wrote: "The buildings are in bad shape and unusable, but there has been some interest expressed in the property. It is too early to speak of definitive plans at this stage."